By cupcakeSerenity on January 1st, 2012 . Filed under: Accessories, Kitchen, Reviews . I am quite impressed! A set of 6 reusable cups will run you about $8.99, but the way we go through cupcake wrappers around here, they’ll likely pay for themselves soon. I’ve already broken them in, and they worked beautifully. My cupcakes took a little bit longer to cook, so be prepared to be flexible, but the cupcakes were cooked evenly, and the silicone cups peeled away from them beautifully. 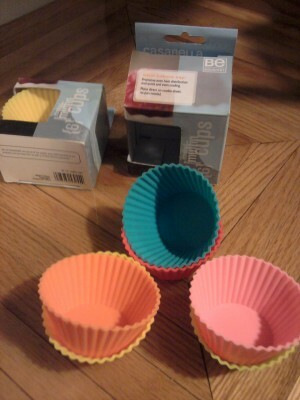 In the end, these baking cups are a great idea, and I look forward to trying to wear them out. They are also super easy to clean, especially if you have a dishwasher! And they come in jumbo size too!